‘All the stars we steal from the night sky will never be enough’. The story about magical love, faithful family, true friendship and unconditional acceptance of who you really are is now out in the cinemas all over the world. An inspiring musical is claiming the status of one of the brightest movies of the new year. What a great start of 2018th! The film takes us back to the past and introduces the audience to the life- (and love) story of P.T. Barnum, a man who started his own circus showing unusual people with their special talents. The cast is breath taking. 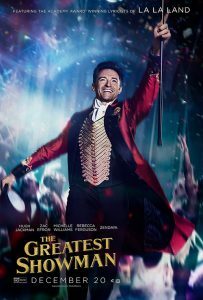 Hugh Jackman at his greatest (find yourself someone who loves you as much as Hugh loves musicals! ), Zac Efron coming back to singing after his ‘music break’ from High School Musical, charming Michelle Williams, stunning Rebecca Ferguson performing one of the best songs (even though not with her own voice) and Zendaya, who is talented in all means. Acting is almost flawless, singing is even better. As well as the choreography together with all the annoyingly attractive outfits! Songs. It wouldn’t be a musical without it, obviously! The soundtrack album got the first positions in charts all over the world. Touching and sincere, magnificent songs from The Greatest Showman can easily make your heart melt and inspire you to follow your craziest dreams. The Greatest Showman is amazing almost in every second of it, starting with the cast and ending with the decorations. Critics exploded this movie but the audience loved it as much as the last year’s highlight – La La Land! Some people say this circus performance is much better than Chazelle’s love story from 2017th. However, watch it yourself and be the judge! ‘A million dreams for the world we’re gonna make’.